All these charts are included in the article below. Although there are plenty of categories that are not covered here, I believe that these are some of the biggest ones our readers will wonder about. And, if you’re interested in tracking how another type of lens has changed over the years, check the bottom of this article for a link to the complete spreadsheet of all 733 lenses to edit as you like. Also, I’m not claiming that the list of lenses I gathered is a complete set of everything released on the market in the past two decades. I’m sure that several slipped my attention. However, I did follow a standard procedure for all of them – adding every single lens from the DPreview lens database since the year 2000, then filling in missing specifications using data from the Photography Life lens index. That totaled 733, which is a large enough sample to show good trends, and that was my goal anyway. How did I pick which lenses to include or exclude? In general, I didn’t skip over anything at all if I could help it. That means the charts below include lenses from obscure brands like Kamlan and 7artisans, as well as “gimmick” lenses from companies like Lensbaby. The same is true for specialty companies like Leica and Hasselblad, as well as defunct lens formats like 4/3 DSLRs and Samsung mirrorless cameras. I chose to do so because all these lenses are part of the road to photography today, and the truly obscure ones are only a small fraction of the total. Almost all the lenses examined below are viable options on the market that many people still buy today. I only included lenses for 4/3 sensors or larger, which means that Nikon 1, Samsung NX-M, and Pentax Q lenses were excluded. The only lens I excluded as an outlier is the Sigma 200-500mm f/2.8, which weighs 15.7 kilos (34.6 pounds), more than three times as much as the Nikon 800mm f/5.6. The dates associated with each lens below are announcement dates, not shipment dates. Before getting to the charts, here’s a quick explanation of why I presented the data below as I did. Which one – average or median – gives you a more useful sense of the five numbers above? Which one tells the more complete story? Neither, really. The answer depends on which information you value more, and how much you want to account for outliers like the number 94. Lenses are a lot like the five numbers above. Most lenses weigh within a small range, easy to handhold and not too heavy. However, manufacturers sometimes release a massive 400mm f/2.8 or 600mm f/4 telephoto that weighs potentially 10x more than the rest of its lineup. Should those lenses be included in a fair analysis? There are good arguments either way. Personally, I would rather the numbers not be skewed too strongly by mega telephoto lenses. I’m more interested in how ordinary, everyday lenses have changed over the years. So, I believe that the median is the most important number overall in this instance, since it isn’t affected as strongly by supertelephotos. Of course, your own preferences may differ. That’s why I’ve included both a running average and a running median chart in each section of the article below. The “running” method is a good way to examine the state of lenses at a given point in time, because it only pays attention to the newest lenses on the market. 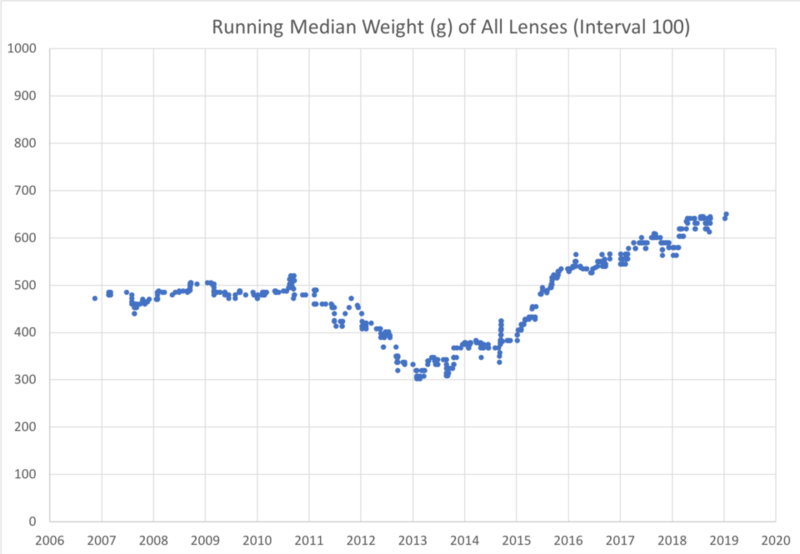 If you aren’t familiar with running averages or medians, they answer a simple question: On a given date, how much did the 100 newest lenses weigh? (Or the newest 50, 25, 15, etc., lenses – chosen based on the “interval” specified.) That number is a good way to see trends buried in a large set of otherwise difficult data. Lastly, note that I kept the scale on the vertical axis identical for each of the three chart types. 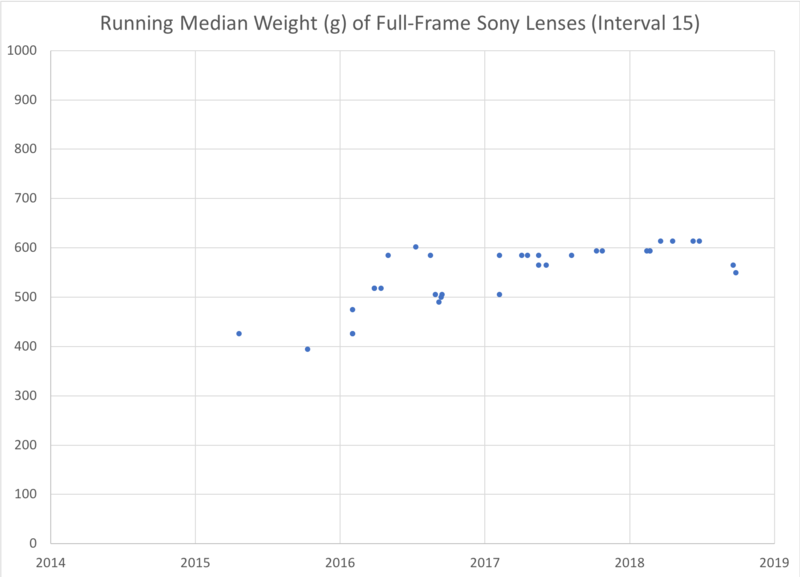 This makes some of the later charts look a bit sparse, but it provides a better way to compare the overall weight of each lens system, which I believe is worth the tradeoff. When we look at every single lens released since the year 2000, all 733 of them, a few takeaways are quite clear. 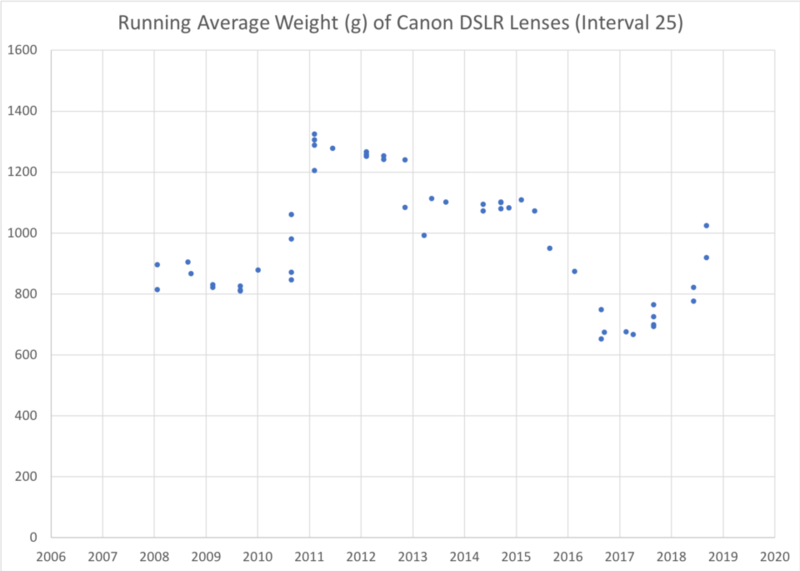 First, more lenses were simply announced recently than at the beginning of the 2000s, which is no surprise given that the number of camera and lens companies has only increased over the years (and camera sensor formats, too). Second, lens manufacturers in the early 2000s had no qualms about producing unwieldy telephoto lenses. Four of the five heaviest lenses in this chart were announced in 2007 or earlier. Starting in about 2003, it’s easy to find lenses that weigh well over the 2 kg mark. On the other hand, “medium heavy” lenses, in the range from 750-1000 g, weren’t really popular until about 2012. In 2015 and beyond, those lenses really exploded in popularity, similar (for the first time) to lenses in the 500-750 g range. 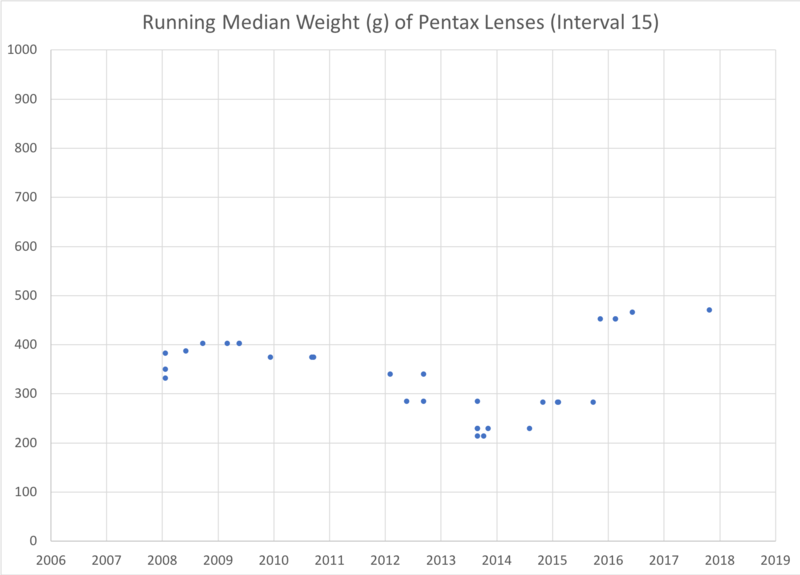 These charts show one thing quite clearly: After gradually decreasing in weight over the early 2000s, lenses have started to get significantly heavier in recent years. The difference is surprisingly large. 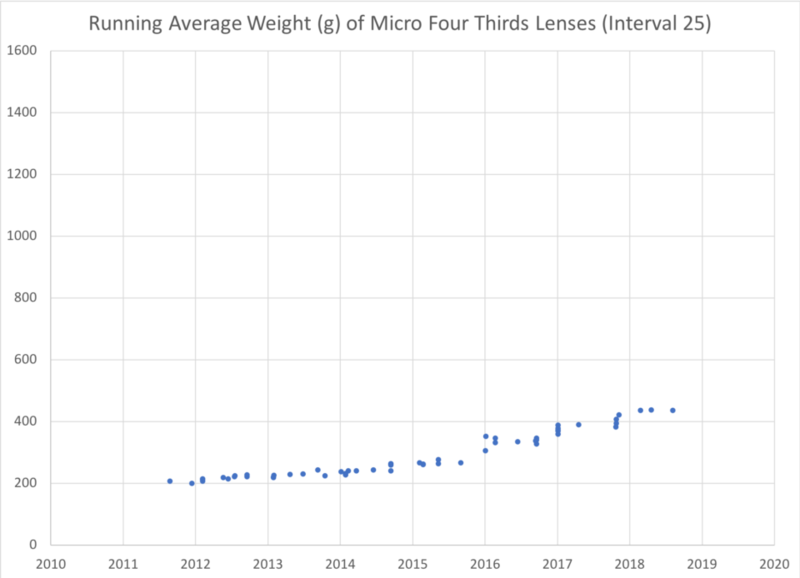 Today (January 2019), the 100 newest lenses on the market weigh an average of 797 grams. Six years ago (January 2013), the 100 newest lenses weighed just 531 grams on average. This trend is even clearer in the running median numbers, which aren’t skewed by telephotos as much. Specifically, the 100 newest lenses on the market today weigh a median of 650 grams. In January 2013, that number was just 320 grams. That’s less than half. In fact, by this standard, today’s lenses are the heaviest they’ve ever been, at least in the digital age. However, another takeaway from the chart is that older lenses were plenty heavy as well. 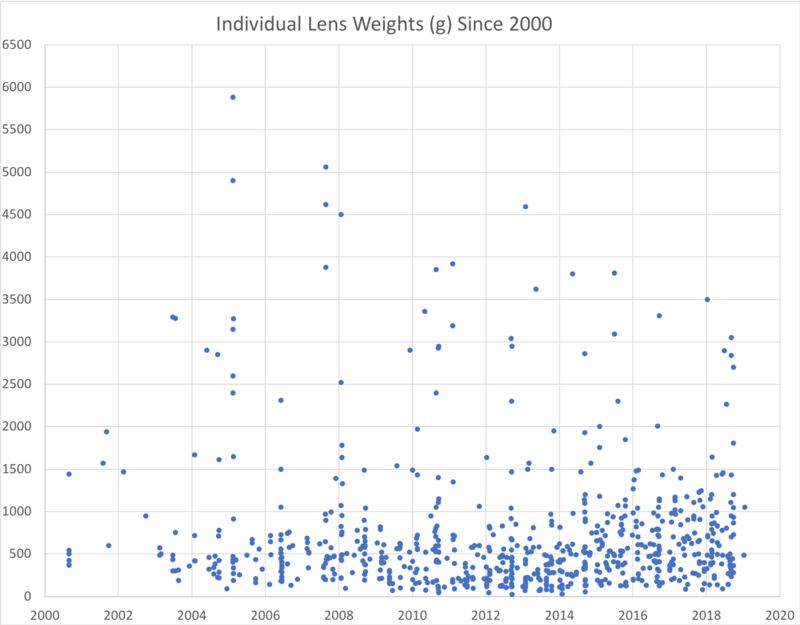 According to the Average chart, lenses in 2008 were heavier, slightly, than lenses today. That fact is partly due to the large number of supertelephotos released in the early 2000s, though it isn’t the only reason. That last little jump in the median chart isn’t really significant, unless it keeps going up for the next few years. 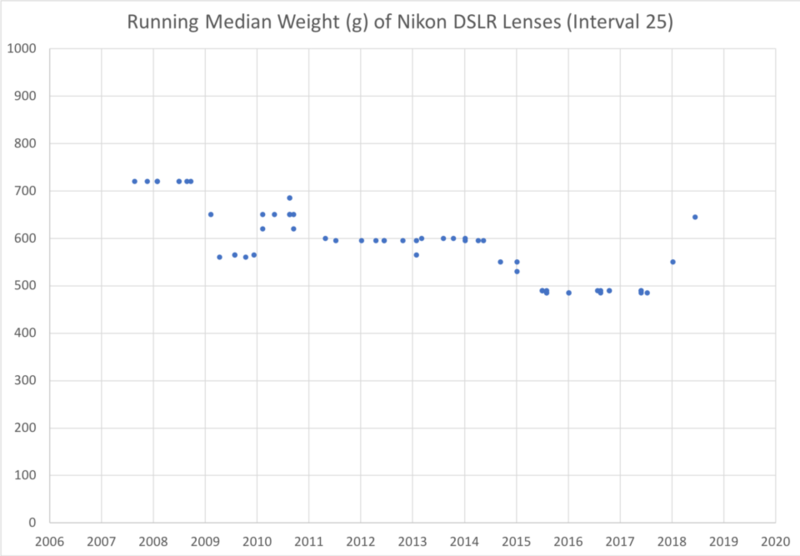 Overall, Nikon has remained very constant in its lens weights – one of the few manufacturers to do so. These charts are quite steady overall, similar to Nikon. Based on these tables, the weight of Pentax lenses has remained relatively constant over time, similar to Nikon and Canon, perhaps increasing marginally in recent years (though remember that the sample size is relatively small). 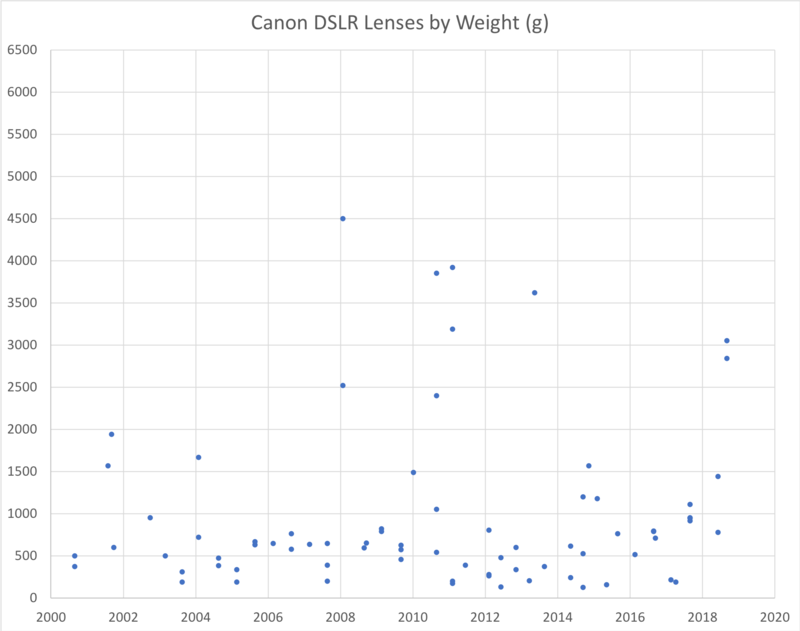 There were an impressive 160 third-party DSLR lenses released in the past couple decades, making it easy to draw conclusions from the data below. 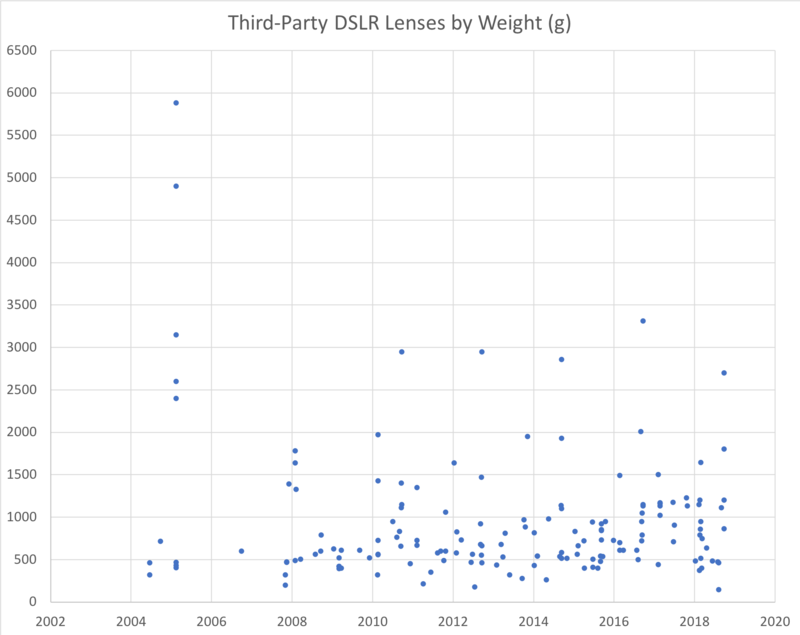 In short, third-party lenses have gotten significantly heavier in recent years, a steady increase from about 600 grams (median) to 885 today. 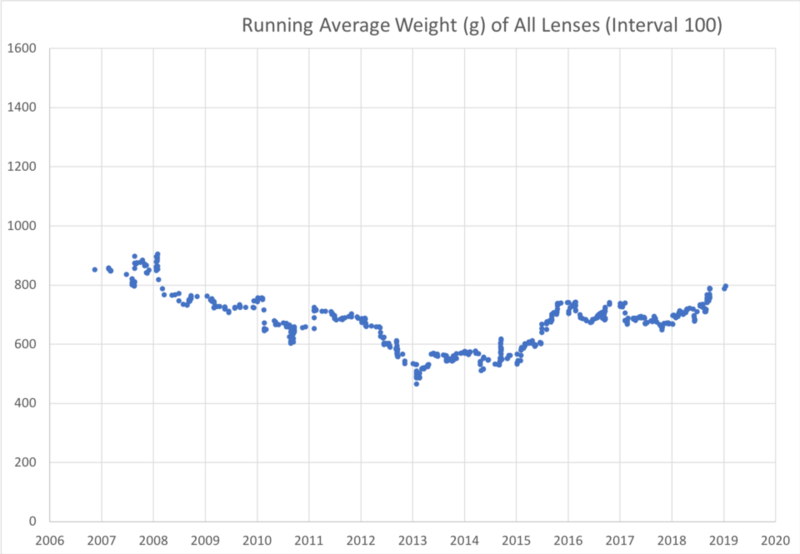 As an interesting aside, you’ll notice in the first chart that five heavy lenses were announced on exactly the same day in 2005 (February 14 specifically). All of them are Sigma’s. That day alone shifted the overall lens averages more than any other so far this century. There have been an impressive 81 dedicated Micro Four Thirds lenses released since the first one in September 2008. Over that time, they have grown in weight at a steady pace, as you can see below. This section only includes lens made exclusively for Micro Four Thirds cameras, not APS-C lenses or full-frame lenses also sold in a Micro Four Thirds mount. Most of them are Panasonic and Olympus lenses, but a handful of third-party lenses from companies like Sigma and Tamron are M4/3 only, and they are included in the charts below. And, like Fuji, the overall lens weights appear to be increasing – but it might just be a fluke of the smaller data set. Personally, my biggest takeaway is that lenses today are some of the heaviest we have ever had – maybe the heaviest, period. However, not all categories have increased in weight equally, or even increased at all. 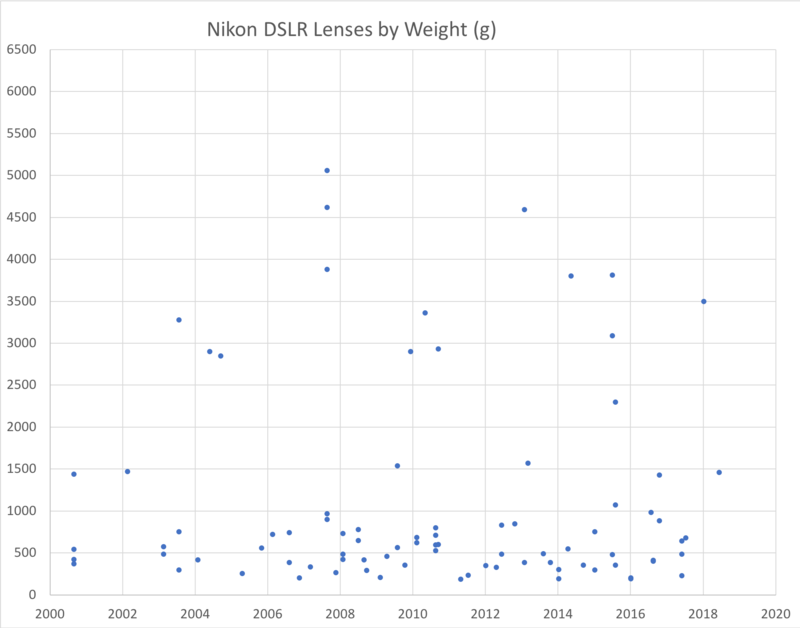 Nikon lenses are arguably trending slightly lighter than before, and companies like Canon and Pentax have been fairly steady over time. 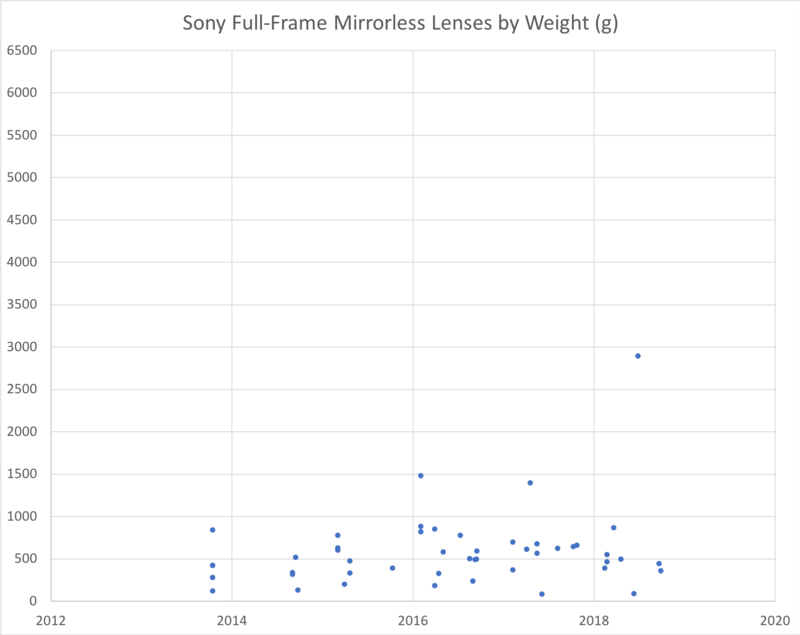 Instead, most of the weight gains over the past 6-7 years come from third-party lenses and, interestingly, mirrorless lenses (regardless of brand). This is despite the impression that we are entering a “lightweight mirrorless era” today. 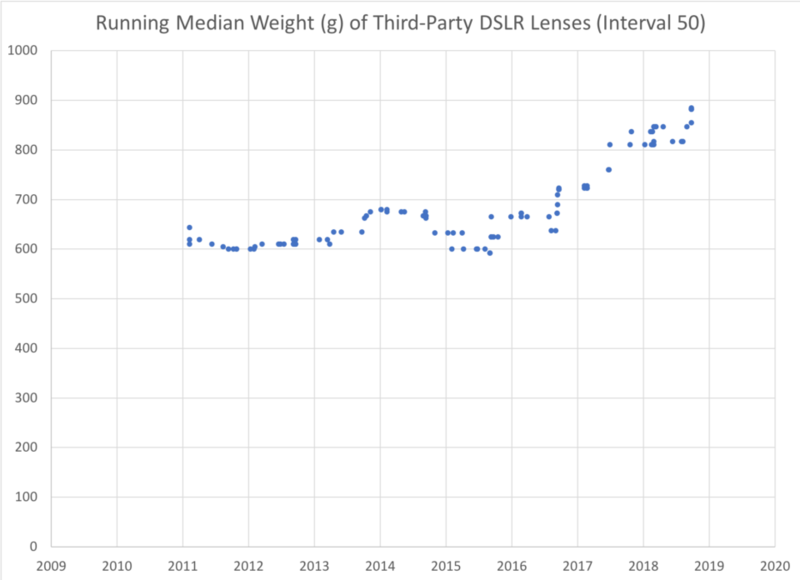 Although the charts clearly show that mirrorless lenses overall are still lighter than DSLR lenses, they have been getting heavier more quickly than their DSLR counterparts. 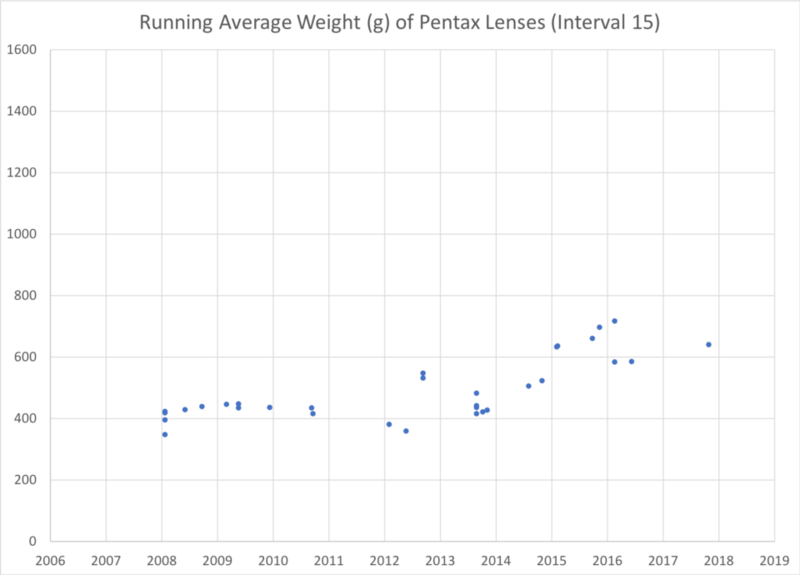 As a result, it is no surprise that today’s lenses are trending upward in weight so noticeably. This isn’t necessarily a bad thing. Lenses today are also sharper than ever before, with wider apertures and unorthodox designs like f/2 zooms that we haven’t seen until recently. Although manufacturers might be trending away from lightweight lenses, it seems like photographers are doing the same – and even if you’re not among them, there are still a large number of lenses available today to fit your needs. And within certain classes of lenses where weight really counts, such as supertelephotos, there has been an undeniable trend of lighter lenses in recent years, thanks to technological developments like fluorite lens elements and phase fresnel glass. Hopefully you found this article to be interesting! It took some serious effort to put together all this data for hundreds of lenses, and the project isn’t over yet. Share this article if you thought it was a good read, and let me know in the comments if there is anything in particular you want me to look at for part two. PS I believe it is the convention to label or caption one’s axes even when the text surrounding the chart states what those numbers are. Of all the things to complain about in photography. How absurd. I agree. Imperial system is stupid. Maybe we should add other units too, like Stone for all those old British enthusiasts? And chickens so we can relate to how many chickens each lens is equivalent to. Just so, however, some of the comments were rude and unworthy of this excellent resource. Indulging my pedantic side… grams are units of mass, not weight. Newtons would be weight. Metric is useful and avoids silly units like slugs or poundals. Have said that, my favorite unit of velocity is furlongs per fortnight! Cheers to all. The world got over imperial units quite a while ago. Even NASA dropped them officially some 30 years ago. It’s an excellent (albeit long overdue) time for the rest of you to catch up! The replies to my comment requesting additional information were unseemly to say the least. The sarcasm was infantile, intolerant and unworthy. Thanks, boys. Time to grow up and get over yourselves. It is not a question of not understanding metric, which is simple. It is a question of being able to relate to a measurement, in this case of weight, in a way that has meaning rather than being just a translation without the foundation of a lifetime of usage. Elaine, 454 g (therefore, around 500 g) = 1 lb. You can get a feel for the rest from there. Imperial works just fine in Burma, Liberia and the US. Ignore the juveniles. It just feeds their immaturity. I prefer the decimal measuring system but, like you, am stuck with the one I grew up with (Imperial) and find it frustrating to not see both measurements included when reading blogs such as PL. Name-calling doesn’t change the facts: imperial units are superseded and converting is trivial, specially in a spreadsheet. Given that this is a scientific article, lenses expressed in grams and kg are quite appropriate. The article is great. The author has already done alot to bring us the info for free; you really should do the conversion yourself! Hi Elaine, wow, your comment sure generated some responses. At this point, it’s too late for me to add an Imperial measurement to the images in the article (not sure I have enough Excel know-how to do that properly anyway), but I’ve added a pounds column to the spreadsheet linked at the bottom of the page. In the future, I’ll do both in the charts if possible. Thanks, Spencer. Isn’t it reassuring to know that we have the metric police as readers here at PL, on guard and keeping us safe from imperial measurements at all costs and in every situation? Whew! Their judgments are spot on accurate: everybody should be using metric after 30 years. I feel that society is much safer now, don’t you? Thank you for your thoughtful consideration of my comment. You are a gentleman and a scholar, as we used to say before it was disallowed by the correctness police, another watchdog group without whom society would slowly die. Elaine, maybe mockery is relieving for you and certainly for many, but it’s no argument. I and others tried to explain you why the imperial system has little to no place nowadays, there’s nothing wrong with that. I understand you don’t agree, it’s a system you’re not used to. I am, I grew up with both system and my brain needs just a short (-ish) time to do the conversions, but I understand your reluctance. However, I believe we’ve been most respectful and laid out compelling arguments without mockery, fun or name calling. Spencer might have his reasons to use metric (maybe he looked at the PL traffic and saw the the majority of the readership is from countries with that background, maybe he just likes it more, etc… I do not know) but “thoughtful consideration” or “gentleman” are not things I’d pin on him because of his caving in to the use of the imperial system. For what is worth, I do think of him as thoughtful, considered and a gentleman, but based on other information. No one cares what you think about the Imperial System, Martin. The lady simply made a request to the author. If you don’t like the Imperial System, you don’t have to use it. It isn’t as if she was asking to change the charts to Imperial and make you convert to Metric. But it would be trivial for you to do either way. Clearly Martin, you did not read some of the early replies if you thought that they were respectful. My sarcasm, what you called mockery, was not meant to be in place of an argument. You sadly mistook me if you thought I was making an argument for the world to use the imperial system. I don’t need instruction or explanation of either system. What I did need was the measurements to be written in both methods. And yes, it was thoughtful for Spencer to consider my request seriously. As for the phrase ‘gentleman and scholar’, the point was that it was an old fashioned saying to highlight that things that are old fashioned, like the imperial method, are still comprehensible to some people, though as it turns out, clearly not to you. It seems that your understanding of idiomatic expression is not broad, and could use further study, because you certainly missed the boat on that one. I have a word of advice to you and all the other wits – before you attempt to condescend to someone you should ascertain that you are starting from a superior position. It is very hard to look down on someone who is standing above you. Elaine, what is clear or unclear to you, and what seems or doesn’t seem to you, might or might not correspond to reality, as well as your choice of adjectives. Regardless of the points you muddle, this is a great opportunity for you to have a look at the Metric system and try to master it. It will only benefit _you_. Keep shooting the messenger and nitpicking here or there, it’s all the same. But do have a look at the metric system, it’s definitely easier than the Imperial to learn, and more systematic. Hence its ubiquitous adoption. Metric to Imperial I can cope with… it’s Centigrade/Celsius to Fahrenheit that has me foxed. A very interesting analysis. It just goes to show that to increase the performance of lenses you can’t beat basic physics and hence the weight gain ( glass is very heavy). Maybe sometime in the future we’ll begin to see organic lenses with a significant reduction in weight. I myself would be wary of organic lenses as with UV exposure, plastics deteriorate over time. Perhaps they can mitigate this effectively, but I’d want to take a wait and see approach first. It does feel that we are in for some interesting changes in lens design in the coming years, especially with all the research being done on “flat” lenses and organic lenses. It would be interesting to see how they compare to the traditional glass elements. I’m fairly willing to bet that most of the third party’s spike in weight is caused by Sigma alone. No doubt companies such as Tamron have made weightier lenses (the 15-30 2.8 is not really a feather) none of them (other than Zeiss I guess, but they never bothered with containing weight to begin with) has gone after optical perfection as much as Sigma has, and weight be damned. Tomáš, definitely, a large part of it is because of Sigma. They also were behind a lot of the heft of early-2000s third party lenses, since they released a large number of heavy telephotos around that time. I like their new all-out quality approach, but it definitely leaves a gap in the market for companies to make more pancake-style lenses – lightweight primes with f/2.8 or even f/4 maximum apertures, yet still very good image quality. I wonder how much of this is due to a perceived need by (some – most?) photographers to differentiate themselves from what can be accomplished by the ever-increasing capabilities of smart phone cameras. George, there are a large number of reasons for this weight increase, and that’s an important one. I also think people are making more and more of their purchasing decisions based on reading online reviews rather than going to physical stores and holding/comparing products in person. The online approach is more likely to emphasize image quality, since a lens can be almost universally acclaimed (such as the Sigma 50mm f/1.4) while being heavy, whereas a more “reasonable” lens in weight, like the Nikon 50mm f/1.4, does more poorly in reviews because it isn’t as sharp. 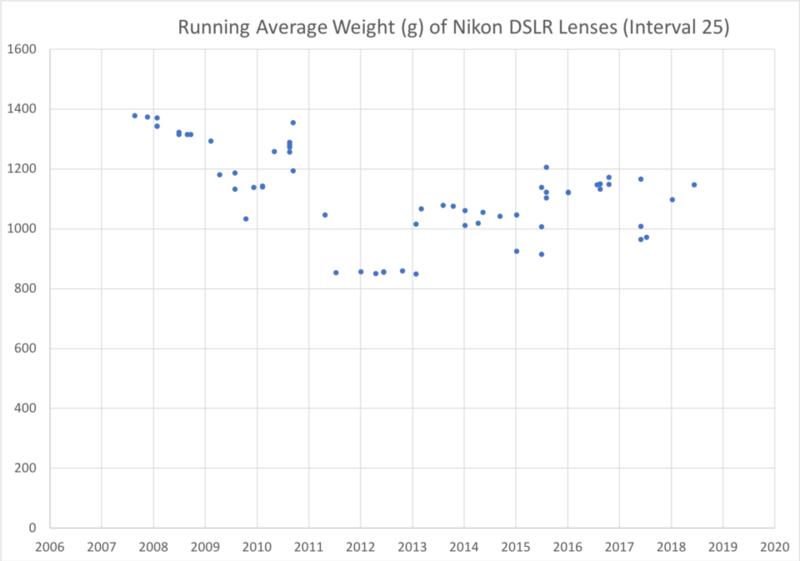 I think people are better off for it as a result – more photographers at the DSLR level care about quality than weight – and manufacturers seem to be catching on. But it does lead to some interesting purchasing decisions, like switching to mirrorless because of the light weight and then buying a lens like the Nikon Z 50mm f/1.8 S for its image quality (not a ridiculously heavy lens, but more than twice as much as the F-mount 50mm f/1.8). It seems the message that “plastic” is as durable or even better than metal has not arrived the group of photographers purchasing high end gear. Guess the same people board a Dreamliner without hesitation. One company is especially going overboard with weight that is Sigma. I would love to buy their lenses but the weight is deal breaker, so the only one I have is the 35mm. Nikon still does a good job with weight, I own the 105 f1.4 and for the sheer size the weight is good – for me. The absolute conundrum to me are the new mirrorless cams. Bernado, agreed, I prefer plastic lenses by a wide degree compared to metal lenses (and same with camera bodies) for several reasons, from durability to temperature to weight. It does seem that manufacturers are making more plastic lenses for these reasons, plus the simple reason of expense, but not all photographers are on the same page there. Metal can “feel” better if the plastic is cheap, and it’s more immune to scratches and surface-level damage, but I’d rather drop a plastic lens than a metal one any day. Thank you for the very interesting (and thoroughly researched) article. I am an enthusiast photographer (happily using my D750 now for about 4 years), and have personally recently “downgraded” from two moderately heavy and absolutely exquisite Nikon primes (28mm f/1.4E ED and 105mm f/1.4E ED), to two smaller/lighter and almost nearly as exquisite Tamron primes (35mm f/1.8 Di VC USD and 85mm f/1.8 Di VC USD). Neither required any “fine tuning”, for what its worth. These are not direct competitors of course, but they similar in use (at least for me). What I find is that the end result is quite comparable, and yet I feel more likely to use the Tamrons (and thus the camera at all). I think this is due to their smaller/lighter form factors, but also because they are less expensive/precious (I am less worried about them getting damaged). I did lose some money on this personal journey, and I gained some insight into what really matters to me. KEH bought the Nikons from me, which avoided the hassle and misery of ebay. Buzz, those are great lenses, especially with the vibration compensation. Now that manufacturers are moving to IBIS with mirrorless cameras, it’s not going to be as much of an issue, but I’ve always found it surprising that companies like Nikon and Canon so rarely include image stabilization in their sub-100mm prime lenses. It would be nice to see a regression line superimposed on the splatter charts. Unfortunately, the regression lines on the scatter plots were too open to being manipulated whether I went with linear vs polynomial vs exponential and so on; I couldn’t come up with a fair way to do it that didn’t impose my bias (of lenses probably getting heavier in recent years). 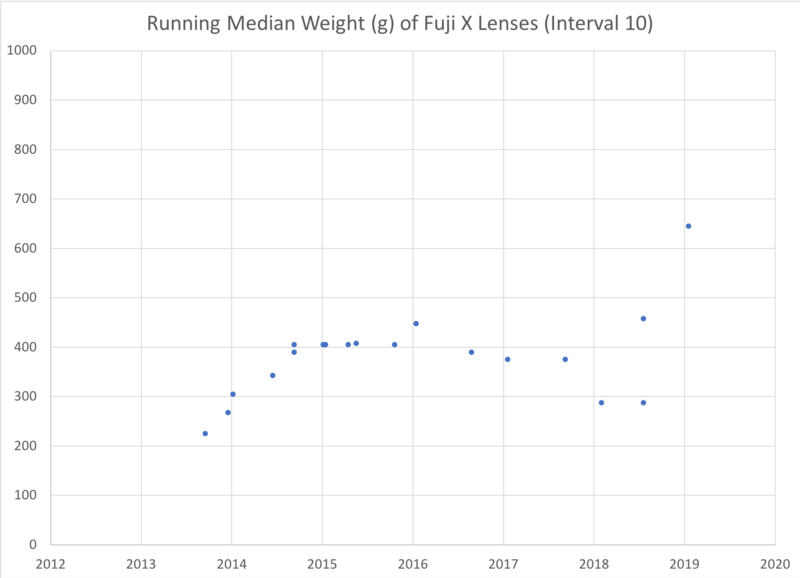 For example, a linear regression shows a slight decrease in lens weight, whereas a polynomial regression shows a significant uptick recently, and exponential is mostly flat. How much of the weight is due to image stabilization? I guess it is more frequently used and increasingly effective, but might be heavier. 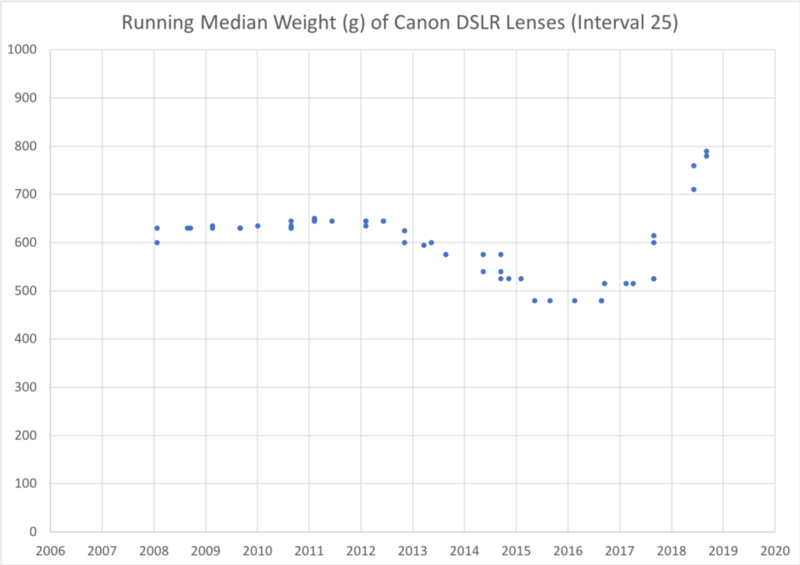 It definitely does add a bit of weight to lenses, but it depends on the lens, and I wouldn’t say it is the driving force behind these changes (although definitely a factor). For example, the new Nikon 70-300mm f/4.5-6.3 DX lens has a non-VR version at 400g and a VR version at 415g. The lenses are otherwise identical. However, sometimes the entire lens design may be changed, including the addition of a VR unit, which frequently results in more than just 15g of added weight. That’s the case with the newer Nikon 24-70mm f/2.8 VR, which is heavier than its (already weighty) predecessor. First, the data and the analysis, will be much more meaningful if you controlled for aperture size. Second, the same for “pro” vs “non-pro” glass, especially for Canon and Nikon. Thanks for the suggestions, Nick, I’ll take them into account for part two. One big problem with controlling for aperture size is the sheer number of different apertures on all these lenses. Should f/1.4 lenses be separate from f/1.8 lenses? If so, what about f/1.7 lenses (of which there are five) or f/1.5 lenses (of which there is one)? It’s also tricky to consider aperture size across formats, since a 25mm f/1.4 lens for M4/3 is equivalent to a 50mm f/2.8 lens for full frame. So although I agree with your premise, I can’t think of a good way to implement it in this format. For pro vs non-pro, I could go by the gold ring Nikons and red ring Canons, and that could be quite interesting. Other than that, not sure how I would be able to distinguish whether a lens is one or the other, so this wouldn’t extend to other brands. Nice article Spencer. Fairly difficult to do a clean analysis since the types of lenses have changed over the years, but I suppose the main reason is number of lens elements having increased for improved IQ. 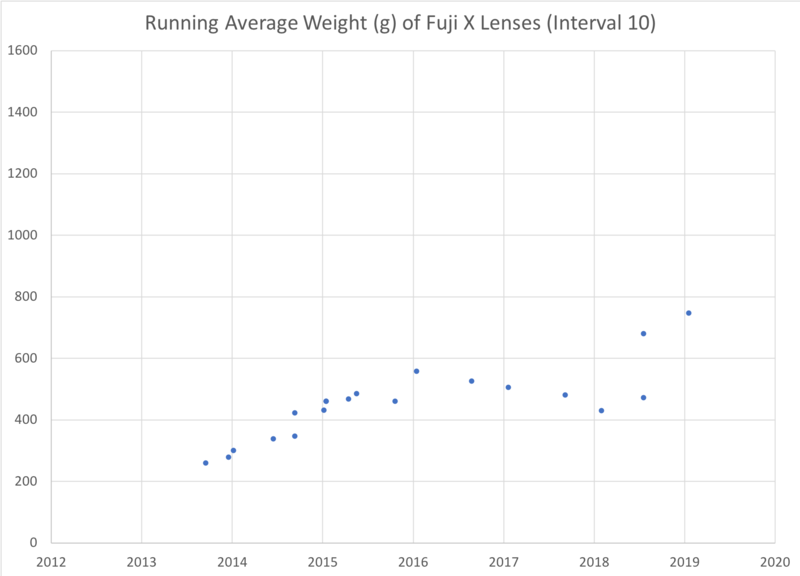 Additionally, for most non-telephoto lenses (that can’t benefit from fluorites) the weight will have increased in the last 10-years or so because ED glass is generally heavier and VR systems add about 100g with their 3-5 extra elements. On the other hand, magnesium alloys reduced the weight of many lenses by about 10% when it was brought in in the 2000s. As you are clearly handy with analyses, what would be really interesting is a study that looks at the focal length of zooms at various focusing distances. As everyone knows, the Nikon 70-200/2.8 VRii is really a 70-150mm lens unless you focus beyond about 10 metres. Similarly, many super zooms are nowhere near their specified range apart from at infinity. It would be great to have a chart that showed the actual focal-length of the popular zoom lenses at a selection of distances, like 2, 3, 5, 10, 20 metres and infinity. Thank you, glad you enjoyed it! Focal length breathing is an interesting topic as well – and not just focal length breathing, but also how accurately (or not) focal lengths match the manufacturer specifications even in the best of cases. For example, when I was testing several 14mm lenses a few months ago, it was pretty clear that some were wider or tighter than others. They all probably fall within the 13.5 to 14.49mm range, but that’s a big gap at such wide focal lengths. It would be nice to add that information to our reviews. 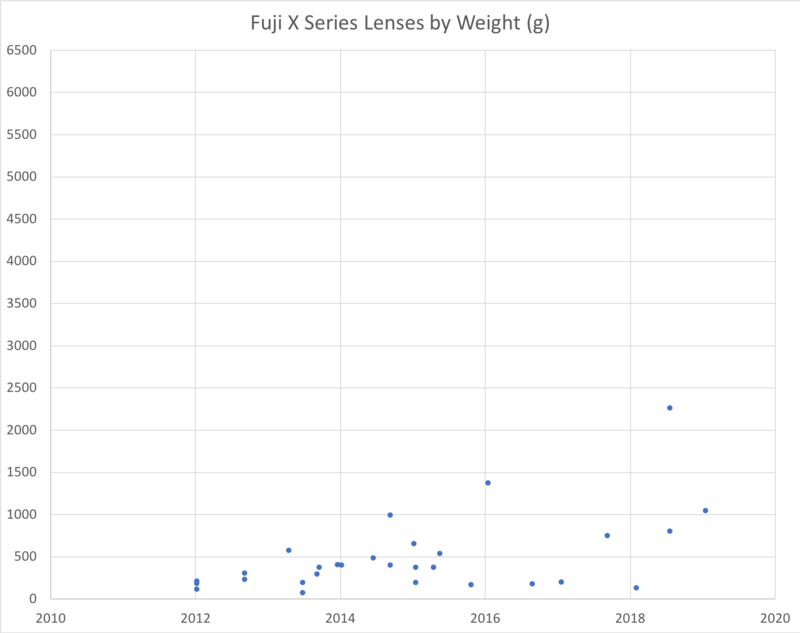 How about comparing the weight trend to the *types* and *features* of lenses consumers are buying? Could it be the manufacturers are simply releasing lenses in the categories with the biggest sales? When I got my first couple cameras, moderate aperature *prime* lenses were the standard – much lighter than telephoto lenses. Now I think most consumers get a small telephoto as their first lens. And increasingly, the “bokeh fad” is driving the sales of large aperature telephoto lenses (i.e. much heavier). Locally, at least, I’ve seen a trend from standard telephoto lenses to constant-aperature telephoto lenses, which may again be increasing weight (I learned early on that these sort of lenses were frivolous and extremely limited in application, but I guess an untrained consumer sees the loss of aperature with increasing “zoom” as a negative or sign of a lesser lens and doesn’t consider the size/weight penalty). That’s very true – we would expect to see these effects if manufacturers simply decided to release more telephoto lenses, not actually make their regular lenses any heavier. I’m hoping to cover some of that in part two, although the big problem is sample size. For example, even for something super popular like a 50mm f/1.4 lens, only 13 were released in the last 20 years. Most other focal length/aperture combinations are worse, even seemingly “popular” combinations like 35mm f/1.8 lenses (10 released), 85mm f/1.8 lenses (five released), and 28mm f/1.8 lenses (one released). Although I can certainly combine some of these into a single category, that’s only easy with more typical lens designs. If I do a category of standard zooms and wide zooms, where would the Sigma 24-35mm f/2 go, or the Canon 17-40mm f/4, or the Nikon 18-200mm? All that data takes a long time to crunch, so I’ll have to prioritize which of these questions are most important to answer for part two, and then figure out a way to do it that doesn’t limit sample size too much. I belueve, it will be very intetesting to follow weighr changes for a groups of SIMILAR lenses. What is very clear from the complete Canon and Nikon charts is the fall in weight of super-tele primes, which is due to the use of fluorite glass and magnesium alloy frames. For most other classes of lens, the weights have increased because they can’t benefit from the same super-tele improvements, and they have had more glass and VR units added in recent years to improve performance. This is exactly what I was thinking. I don’t see how it’s useful to compare the weights of ALL lenses, but if you could show trends in the weights of similar types of lenses, it would be interesting. Look at weights within categories (as Alex Potemkin suggests above); then we could see if there’s a trend and maybe even figure out what’s driving it. Not too late, Alex! I’m planning to do some of that in the second part of this article. But as Dieter says, sample size is going to be an issue here. 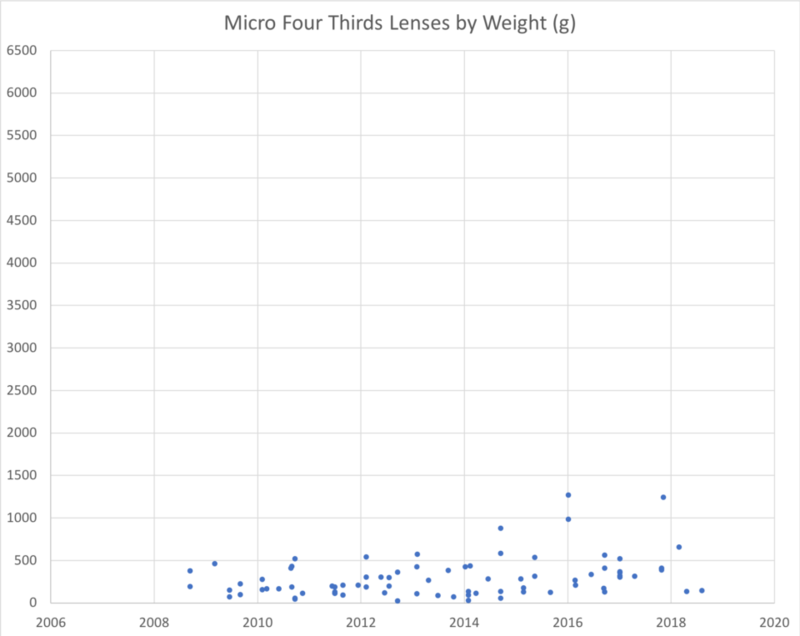 50mm lenses are the most popular type, and there are 42 of them total (across all sensor sizes), which is barely enough to do the same type of statistical analysis as in this article. Other categories you mention have fewer than that, so the question is whether there is enough data to rule out fluctuations and establish a clear trend. The method I used for the article above isn’t perfect, but at least the sample size is large, so we can draw some meaningful conclusions from it. Another problem is the existence of some “strange” lenses like the Sigma 24-35mm f/2 and Canon 17-40mm f/4, both full frame lenses, which don’t fit neatly in any of the categories you mention. And different sensor sizes can be a problem, too; I’d likely have to do all this by equivalent focal length, which is a lot of numbers to crunch when there are 733 lenses in total. This isn’t to say I won’t do any of this, but that I need to pick and choose pretty carefully where to spend my time, because there’s a huge amount of data and a lot of information that would be interesting to know. As Nasim started with pointing out, outliers have a significant effect on values such as medians and averages. The simplest way would be to exclude all these extremes and focus on some rather clear but representative categories. Plot these weights by introduction year and make a regression line. I don’t expect the line to point as steeply upward as in the 50/f1.4 category, but most will (methinks) point upward. Consider breaking out focal length as well as aperture as their own columns. This will facilitate looking at distinct classes of lens focal lengths – for example fixed focal length between 40-60mm full frame, or the so-called super zooms, or APS-C zoom lenses with long focal length 200mm or longer, or whatever is is that floats you boat. Is it the trend that 24-70mm have gotten heavier as time passes? Or is it by brand? Now all we need is a “helium balloon attachment” to offset the weight of these lenses. 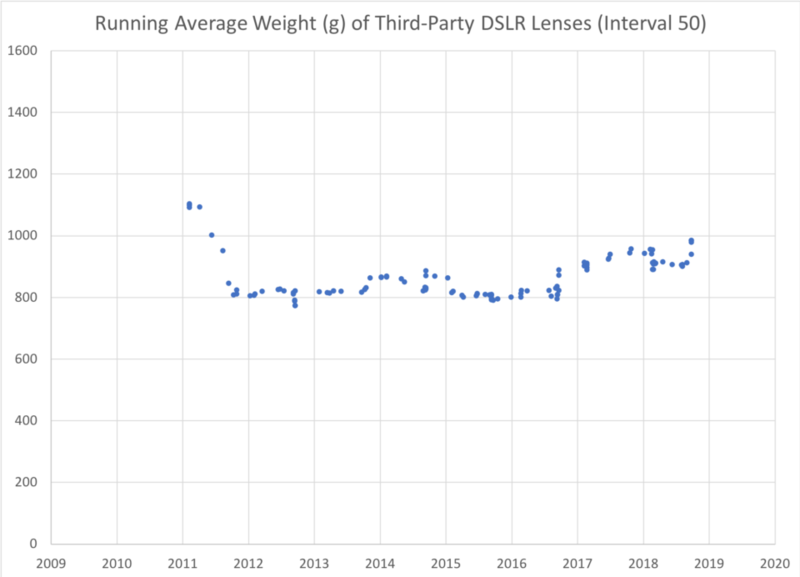 Any correlation, over a similar time frame, between lens weight and pixel quantity of sensors? Hmmmm! 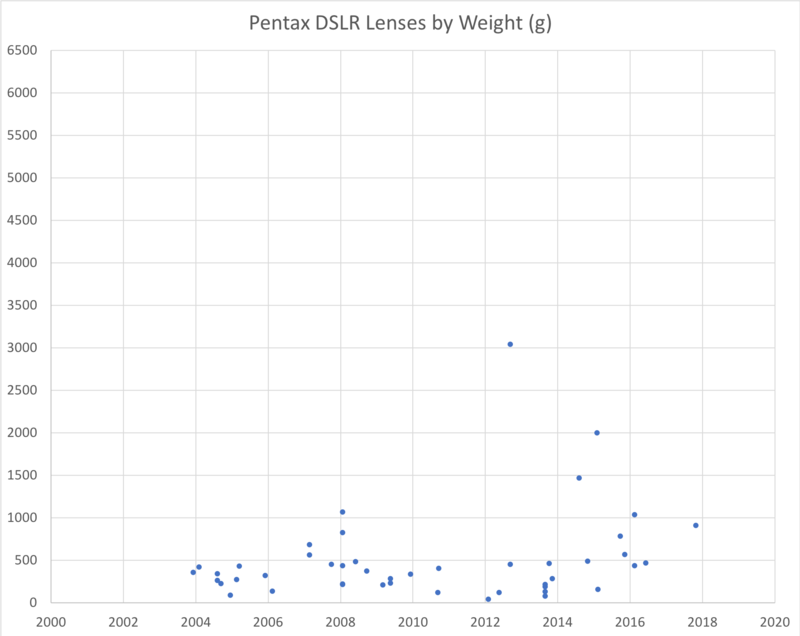 My main takeaway from this article: Pentax has released 46 DSLR lenses since the year 2000? Wha?!? I like the idea behind the project as long as we don’t draw too many conclusions from it. One big issue is comparing manual focus with autofocus and type of autofocus and stabilization. If we disregard this we can say many of the old lenses were actually heavier per feature than modern lens. If we choose a standardized kit based on field of view that were available within each era that would be a very illuminating trend showing how that kit would weigh each year. Thank you for such an insightful article. I am a serious amateur, retired and able to travel more so portability/weight is a huge issue. For this reason I moved to MFT. I note that the incremental improvements to image quality and larger aperatures come at the expense of disprorportional increases in cost and additional weight across all formats. For example, the Olympus 45mm, f1.8 is an excellent light weight lense at 116 grams while their amazing f1.2 Pro version weighs in at 410 grams and costs and costs 4X more! This exemplifies “The Law of Diminishing Returns”. Why is a rectangle (shape of sensor or film) is paired with a circle (shape of all lenses/lense element)? Clearly a square shape for the sensor/film allows for more efficient/smaller/hence lighter lenses and yet square format, for the most part, has been abandoned. Might have a problem with square focusing and zooming rings, not to mention lens innards! But as lens elements don’t seem to rotate there may be some weight reduction to be achieved by chopping off the unused bits of glass. Possibly not enough for it to achieve worthwhile weight saving. Your graphs are all great and insightful, but the above suggestion may perhaps give us another perspective. My personal experience correlates perfectly with your research. This year I added the Sigma 35mm f1.4 and 50mm f1.4 to my Nikon D810 kit. I really do notice the weight if I am carrying both lenses out into the field – it is actually painful to carry the extra weight. I also have an Olympus OMD E-M1 system and love the lightweight f1.8 primes for this system. I also have the Olympus 12-40mm f2.8 Pro zoom and love the performance of this lens but again, the extra size and weight of this lens is tipping the far end of what I want to carry for the small Olympus bodies. So you have accurately described the reality in the market. We are being offered a new generation of high performance, wide aperture lenses and many of us are buying them, or at least enough of us so that the manufacturers keep designing more. there can be many interpretations and justifications on these. Yes, I can see and feel that lenses are getting bigger in pursue of “quality” but there should be a “sweet spot” in between. Thank you for gathering all this data, Spencer. I’d like to give details for just this two types of lenses. You’ll see the steady gain of weight in spite of using lighter materials for the housings. If the lenses get heavier and heavier I wonder how that works out if the mirrorless bodies get lighter and smaller. You’d have to add in some other things like number of elements and quality as modifiers. 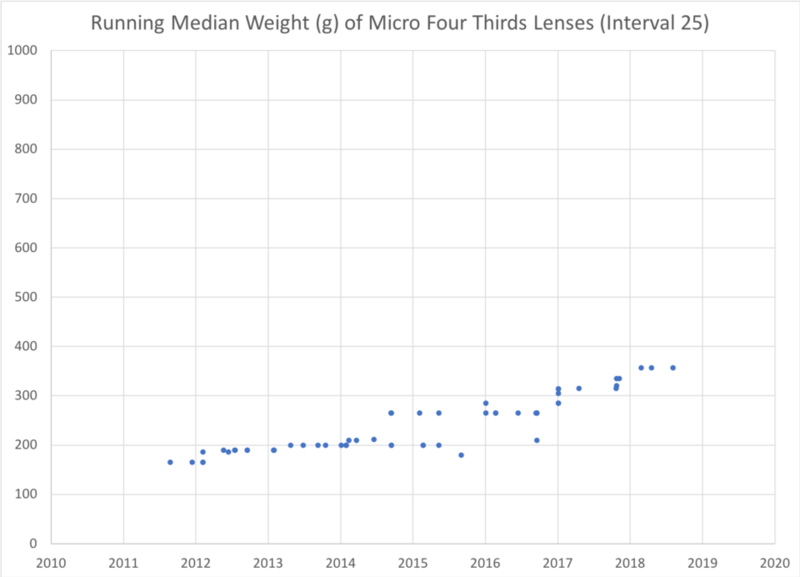 If we were to keep the same level of performance of the first lens as a ceiling, I’d suspect the weight would be in a clear downward trajectory. One could add other factors (e.g. 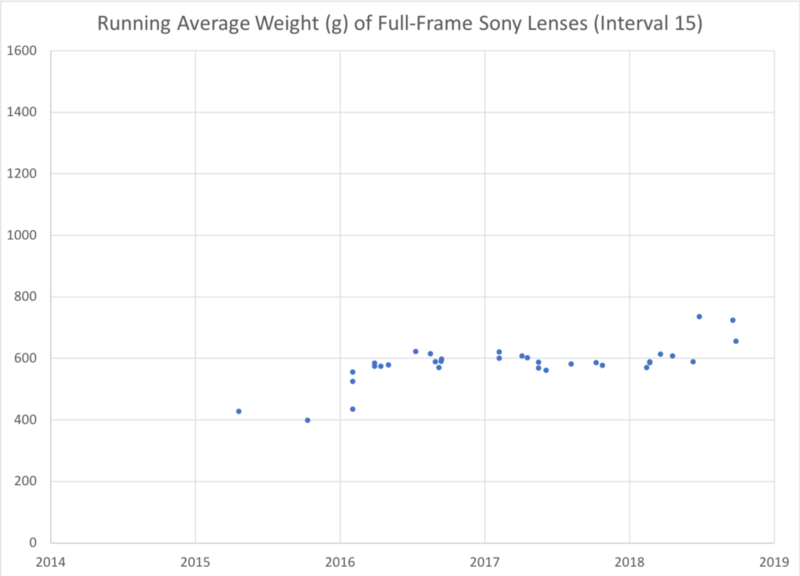 MF or AF) but I agree with Jan and some others that following the weight of a specific type (= focal length and aperture) of lens over many years would be more useful than the current total average of all lenses, which IMHO leaves too much room for speculation about what is going on under the hood. Such an analysis of specific lens types would only work for relatively common spec lenses and would exclude recent optics like very bright and very wide primes and extreme zooms because they didn’t exist long ago. I bet you could still do such an analysis for at least a few dozen types of lenses from 20mm to 600mm or so. But it’s a lot of work gathering reliable data on older ones. For me gear weight is important and I’m not interested in showing off with very big/expensive lenses. At the same time, I’m not interested in light but compromised (small aperture etc.) zooms that are very popular nowadays – I try to find lenses that offer good spec and quality for their weight. Coming from Canon 80D DSLR I just purchased a Nikon D500 which is heavier (and in most ways more capable), however … the Nikon 16-80VR kit zoom is brighter, lighter and better than my Canon 15-85IS kit zoom. The main reason for the switch was the Nikon 300PF lens which is a lot lighter than the old Canon 4/300IS lens and the lens type I use most; it also has better AF and IS performance. Although the general trend may be bigger, heavier and possibly better glass (which completely negates the advantage of lighter/smaller MILC bodies), fortunately some companies see that there is an interesting market for capable but lighter gear as well for e.g. nature photography. I didn’t read the whole article in depth. Where’s the point to just compare the weight of 700 lenses? When there was no 20/1.4, 14/1.8, 40/1.4 with electromagnetic diaphragm, AF-motors, AF clutch and EXIF data, it’s possible to build the lens lightweight – we still can see that with the “dumb” Laowa lenses. And if one wants a 20/1.4, there’s not much of a choice – take the weight or leave it. Also, comparing a 50/1.4 cheapo against an Otus 55/1.4 less-cheapo: What do you get from the information one is heavier? I’m sorry Spencer, you did a lot of work. I just can’t see any benefit. Price, performance, size and weight are depending. Light weight + small size + high performance (+maybe fast speed) = high price. I don’t know how much people want to pay 3000-5000 $ for a 300 gram 50/1.4. Sony 24/1.4: 445 grams, 1600.- Sigma 24/1.4 for Sony: 665 grams, 800.- And the weight difference is not the only diff. Thank you for the article. It was clearly a lot of work. I do wonder why there seems to be an emphasis towards bigger, heavier cameras and lenses these days. It makes sense for professional photographers. For enthusiasts, especially those of us who are getting on in years, perhaps not so much. My Nikon D7500 came with an 18-140mm kit lens. It is a fine piece of glass, but I actually bought the 18-55mm AF-P kit lens for the many situations (like family photos) where a light camera/lens combo is easier to handle. Old duffers with hobby money to burn are not so keen on heavy photography kits (I speak only for myself). Interesting. Not sure if I missed this in article but what about manufacturers incorporating new formula’s for glass and the number of elements in each lens. My feeling is that consumers are pushing manufacturers for faster lenses, so I’m not surprised the number of elements and groups some super fast lenses now have. Maybe it would be more relevant to see the trend of lenses of a given focal lens and aperture, such as all 50mm f/1.8 lenses from all manufacturers. True, the number of specimens wouldn’t be large in each category, but the trends would be more telling. Maybe we should take the focus motor out of the lenses and try to improve focus accuracy and reduce noise when focusing using only the motor in the camera. That ought to reduce weight as a look back at afd lenses indicates. I think it is a good thing there are all these heavy lenses. That they can be made is because they are bought despite the weight and size. You started with the Otus and the Sigma 40mm. Both lenses are one of the finest you can get; Do they need to be big and heavy? It is easier to make a big good lens than a small equal good lens. So thanks to Sigma you can buy this 40mm lens that at f1.4 is as good as others are at f8 for a very reasonable price. There are many smaller and lighter alternatives. Costumer is king. It would be far more significant to chart these for weight versus focal length “buckets” for a given format, e.g., 30 – 40mm, 40 – 60mm, etc. I suspect the only meaningful sample size would be across all manufacturers for FX, say, for lens versions running from the 70’s through current. I went from using large/heavy Nikon film cameras to Leica SM & M equipment, then back to Nikon when I went digital. Two LTM bodies with a 35/3.5 & 90/4 (or 2.8) lenses were small and pretty light given the construction materials of that era. Clearly the trend toward fast aperture glass is a contributor to the weight gain as has been mentioned. I have been travelling for the last 1.5 years with a Sony A7 and mostly small MF rangefinder lens kit, but don’t really like the Sony body. I plan to get a Z series Nikon and hopefully some small/light primes (someone make these, please? ), largely to shrink and lighten my kit. The 24-70 S looks like a good start for light lenses. I do like the size, weight and $s of the Sony 28/2, hopefully Nikon will introduce a lens like this. Appears the answer is no. The market does not replace all existing lenses, so as the total number produced increases, the increase in sigma is washed out by the lack of increase, or even decrease, elsewhere. Very interesting summary. But as you have whole specs in data sheet, I kindly ask to check how specific lenses weight changed in history. How 20, 24, 35, 40, 50 etc. change in time. same for zooms. But still there are some zooms range that are now continued. In Pentax there is great street lens 35-70 3,5-4,5 very usefull ultra small lens. Have lot of cons but still it is very fun to use. For me from quality side, weight is not a problem. But still it is better to have lighter stuff. Blame the pixel peepers. Full frame, large megapixel camera bodies available today combined with editing software allowing folks to zoooooom in and look for the tiniest of lens imperfections are driving the complicated lens formulations (a lot of glass = heavy) needed to achieve the desired resolving power. Consumers get what they ask for. This is an awesome analysis! For micro 43 lenses, the heavier medium weight is logical, at first you only had access to slow zooms and mostly pancakes lenses, then later some faster zooms and much recently some fast telephotos.